Outside of humans, the ability to adjust the intensity of acoustic signals with distance has only been identified in songbirds. Research published Feb. 3, 2016 in Neuron now demonstrates that the male fruit fly also displays this complex behavior during courtship, adjusting the amplitude of his song depending on how far away he is from a female. Studying this process in the fruit fly can help shed light on the building blocks for social interactions across the animal kingdom. 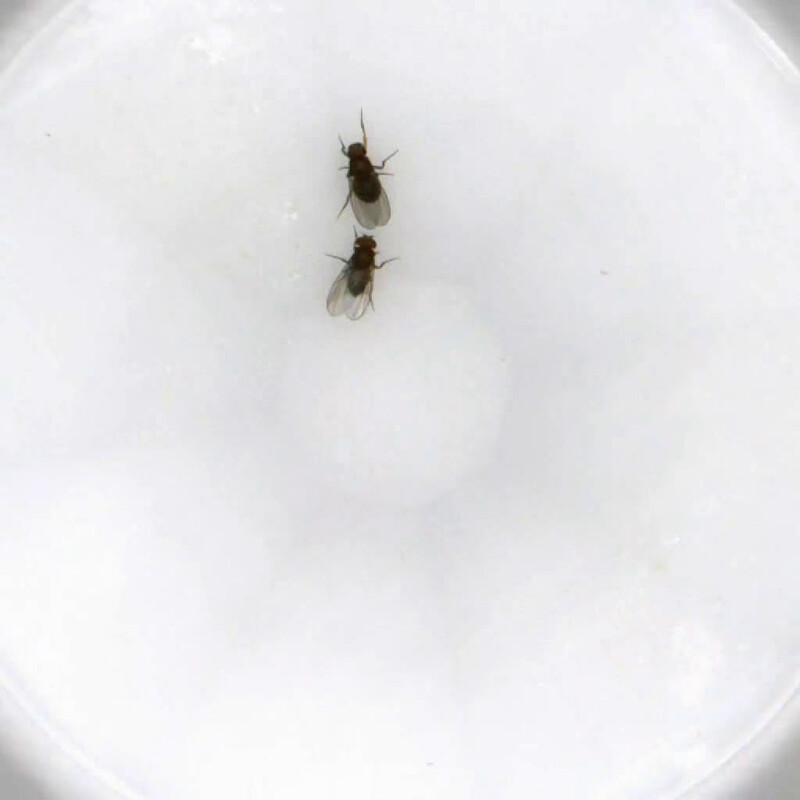 Mala Murthy, of Princeton University, and her colleagues have revealed an unanticipated level of control in insect acoustic communication by analyzing each stage of the neuronal pathway underlying male fruit flies' ability to adjust their courtship song—from the visual cues that help estimate distance to the signals that pass through nervous system and cause changes in muscle activity that drive softer or louder song. The complexity is remarkable considering that the fruit fly has only 100,000 neurons, one-millionth that of a human brain. During courtship, males chase females, extending and vibrating one wing at a time to produce a courtship song. Songs, which consist primarily of two modes: sine and pulse, are extremely quiet and must be recorded on sensitive microphones, then amplified more than 1 million times in order to be heard by humans. When amplified, the sine song sounds like the whine of an approaching mosquito, while the pulse song is more akin to a cat's purr. "Females listen to many minutes of male song before deciding whether to accept him," says Murthy, of the Princeton Neuroscience Institute and Department of Molecular Biology. "There is thus enormous evolutionary pressure for males to optimize their song to match the female's preference while simultaneously minimizing the energetic cost of singing for long periods of time." Adjusting the amplitude of song to compensate for female distance allows males to conserve energy and thereby court for longer periods of time and better compete with other males. "While the precise neural mechanisms underlying the generation and patterning of fly song may be distinct from humans or even songbirds, the fundamental problem is the same: how can a neural network produce such a complex and dynamic signal?" Murthy says. "For this reason, we anticipate that similar neural mechanisms will be employed in all systems, and the genetic model system of the fruit fly is an ideal starting point from which to dissect them."